There's a lot of tents in Kenya . So, why do we bother with glamping tents? What makes our tents so special? There are five beautiful glamping tents ready for you to choose from when you stay at Sieku Glamping. We deliberately only have five tents so that your experience with us will be more intimate and exclusive and you'll properly feel like you're away from it all. Our tents are all new (we've just upgraded them recently) and they are the highest quality tents imported from the UK all of which have special features that make them very unique for Kenya. Our tents are a unique design, especially when compared to a standard safari tent. They're made out of strong but lightweight cotton which means they are breathable - and the cotton is a beautiful light, natural tone. All our tents come with a sturdy PVC floor which is waterproof and each tent is big enough for you to stand up and walk around in. 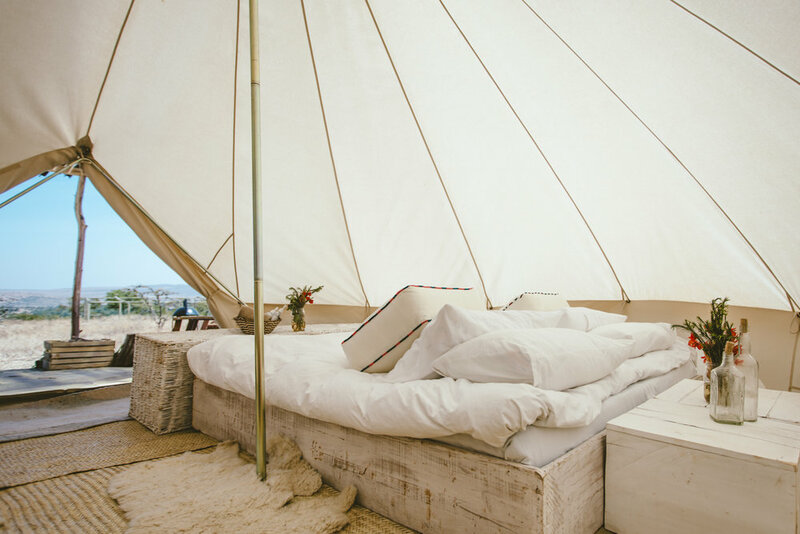 Uniquely, the sides of some of our tents can also be rolled up so that you can let in the breeze - perfect for lounging around in on lazy days. Each tent is beautifully furnished with a range of hand-made furniture and little touches to make your stay cosy and romantic: king size beds; feather duvets; cotton bedding; freshly cut flowers; sheepskin rugs. Extra beds can be added on request for families with children or large groups. Sieku Glamping's tents each have a beautiful ensuite bathroom, complete with outdoor shower, toilet, washbasin and locally-made Cinnabar Green organic soaps, shampoos and conditioners. And each tent has its own little private verandah, complete with sofas and deck chairs, a range of plants and flowers, as well as firewood and a little burner in case you want to set by your tent at night and watch the night sky. There are three classic bell tents at Sieku Glamping. The bell tents are very large and can accommodate big families and groups of friends. At 6 metres, our biggest bell tents can accommodate six people easily. Our bell tents have been specially designed for the African climate. This means more windows than an average bell tent, as well as a mesh door, which creates more airflow and breeze for warm nights. The sides can be rolled up high for hot days too. This tent is inspired by the North African nomadic Touareg tribe, and is a very unique tent indeed. The Touareg has front and back doors, as well as four very large windows - far bigger than the bell tents - perfect for enjoy the many fine views on offer at Sieku Glamping - and which create a very light and airy tent. It's a slightly smaller tent than the others and so perfect for a couple or a small family. Uniquely cone shaped, and based on the native Indian tent, our tipi is the only one in all of Kenya! This is a big tent, especially in terms of it's height, and large enough for a family or a group of four of five adults. The tipi does not have windows, but has an especially wide and tall double door, and the ground sheet can be unzipped allowing you to open up the sides and enjoy a cool breeze on a hot day.